Volume 2 picks up where Vol. 1 left off, with more songs from Robin’s concert-lecture of the same name. 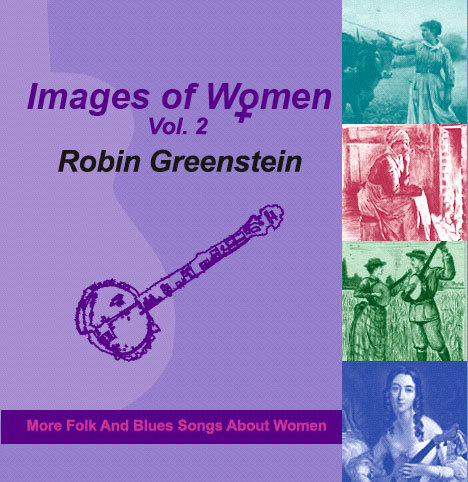 It is nearly an hour of music and has 14 traditional Anglo and Afro-American folk songs, all about or by women, sung by Robin and performed on banjo and guitar with bass, percussion, fiddle, harmonica and more. New in Volume 2 are a few contemporary songs (composed 20th Century) by such luminaries as Peggy Seeger and Christine Lavin. There is also the iconic song “Union Maid” by Woody Guthrie. On this CD you will find such classic folk and blues songs as “Frankie and Johnny”, “Sweet Betsy From Pike”, “Come All You Fair And Tender Ladies”, “I Never Will Marry” and others. The CD is available here. You can also purchase it at CDBaby and digital e-tailers everywhere. Click here to buy hard copies of the CD. You can listen to sound clips of each song by clicking on the arrow in the red circle to the left of each title.